Is shark diving beneficial for the sharks? With the recent coverage of the cage diving accident at Guadalupe, a lot of people have commented that shark diving should be banned. Obviously my view on that may be biased, since I own a shark diving business, but I have some facts that may change your view on shark diving. Did you know that shark diving operations have prevented poachers from fishing for sharks at Guadalupe? At this point, everyone knows there are great white sharks at Guadalupe Island, including the poachers. If we would stop shark diving there, the poachers would have easy access. 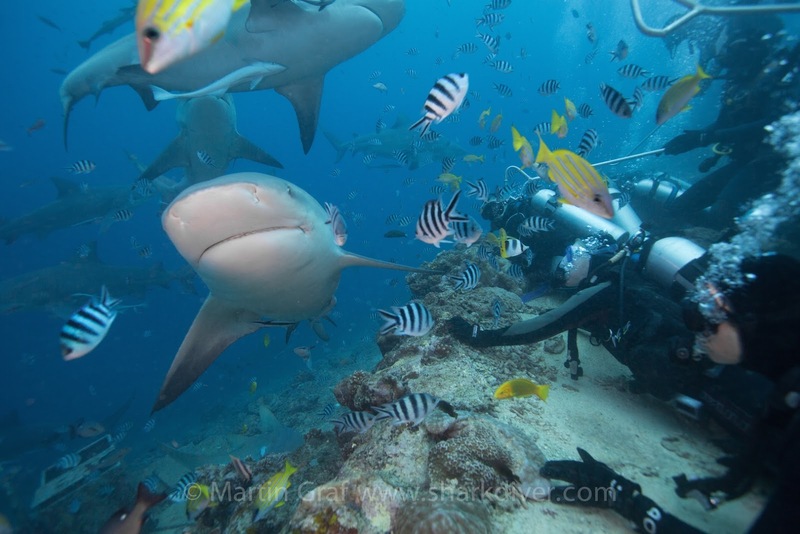 Did you know that shark diving created a National Marine Park in Fiji? The efforts of Beqa Adventure Divers, have directly led to the creation of the Shark Reef Marine Reserve. When they started diving there, they went to the local fishing village that were the traditional owners of that reef and made a deal with them. They would receive a levy from every shark diver in return for a promise from the village to not fish on that reef. Beqa Adventure Divers also hired and trained their Divemasters, Instructors and boat Captains from that village. After 10 years of diving there, the number of fish species on the reef increased from around 280 to over 480. In 2014 that reef became an official National Marine Park, the equivalent of a National Park in the US. Did you know that Shark Diver donates a significant portion of it’s proceeds to research? We primarily support the Marine Conservation Science Institute who created and maintains the photo ID database of all the sharks at Guadalupe Island. Did you know that Shark Diver started Shark Free Marinas? Did you know that Shark Diver works to get fishing tournaments to have catch and release divisions, instead of all kill? This is actually something we have been criticized for by people who don’t want to see shark fishing tournaments at all. Well, I don’t like them either, but catch and release is far better than catch and kill. One step at a time! Shark Diver is just one company among many operators who actively uses the business to support conservation. We try to emulate our buddies in Fiji. Beqa Adventure Divers who state that they are a “Conservation project, masquerading as a dive operation” We have a long way to go, but we are working on catching up. So how about the issue of conditioning the sharks, by providing them with food? I leave the answer to that question to DaShark who wrote a blog about that issue a while back. The late Rusi feeding his sharks. Conditioning via Positive Reinforcement, the big no-no. We reward the Sharks whenever they approach, very much in the hopes that over time, more and more of them will turn up for a meal – which of course, being smart Apex Predators, they do! We do so in order to show them to our clients – as opposed to, as I shall never tire to repeat, Fishermen who do exactly the same thing in order to catch and then kill them. Just to remind you, this comes from the guy who was largely responsible for creating that national marine park I mentioned above. There are many, many more reasons I could list that show that shark diving, when done properly can greatly benefit not only the sharks, but the ocean in general. It is easy to just oppose shark diving with often unsubstantiated claims, without taking into consideration what the alternative would be. How many of you would be interested in sharks, or aware of them, without all the pictures and videos on TV and social media? None of those would be around, if not for shark diving? Weather you agree with my stand on shark diving or not, let’s agree on something. Just offering our opinions on social media and criticizing others is not saving a single shark. Only actions can do that. Let’s be activists, not slacktivists and keep in mind who is killing sharks. It’s the fishing industry, not shark divers! Let’s go shark diving! Or clean up a beach or…..
By Shark DiverShark reef marine reserveComments Off on Is shark diving beneficial for the sharks? I just got back from my 4th annual trip to Fiji, diving with the “BAD” (Beqa Adventure Divers’) bull sharks of the Shark Reef Marine Reserve. It is an unbelievable experience to be surrounded by lots of these awesome predators. What really fascinates me is not the sheer number of sharks though. The really interesting part is that I’m starting to recognize some individual sharks, not only by distinctive marks on them, but by their behavior. Anyone thinking that “a bull shark is a bull shark” should come to this place and see for themselves. These sharks have very different “personalities”, some very mellow and cautious, others not so much. Of course you need to do more than just one or 2 dives to notice these differences. The first few dives your are simply going to be blown away by the sheer number of sharks and and by how close they’ll get to you. Common wisdom holds that when it comes to sharks, size matters. The big shark always wins over a smaller shark. What I found is that this is not always the case. Some sharks think they are a lot bigger than they really are and compete with the bigger sharks for the tuna heads on offer. “Top Sail” for example is not one of the bigger sharks, but is very adept at getting more than her fair share of tuna heads. Another thing that totally surprised me is how cautious these sharks are, even when food is offered to them. Some sharks will not approach the feeder who’s holding a tuna head and some sharks will only take a tuna head from a specific feeder. 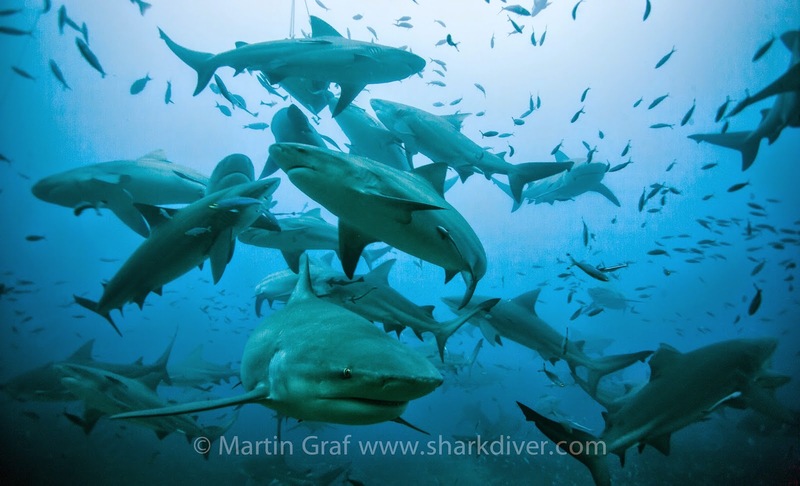 I would have thought that these bull sharks would pretty much go for any tuna head that is offered to them. I’m still very partial to “my” white sharks at Guadalupe, but I’m getting more and more taken by the bull sharks of the SRMR and can’t wait for next year. Thanks to all the guys at “BAD”, (Beqa Adventure Divers) for your hospitality and another unforgettable trip. You are simply the best! Vinaka vakalevu! In the coming weeks we’ll be posting a special offer for next year’s Fiji trip. My descriptions and pictures don’t do these sharks justice. You’ll have to come and experience them yourself. By Shark DiverShark reef marine reserve, swimming with sharksComments Off on I was surrounded by bull sharks! Yes the widespread stoicism in the face of the onrushing onslaught may have seemed peculiar – but the flip side is that after the event, there is no drama whatsoever as instead of lamenting and waiting for others to help, we get up, dust ourselves off and carry on. Your outpouring of support has been frankly humbling, and we all thank you for that. 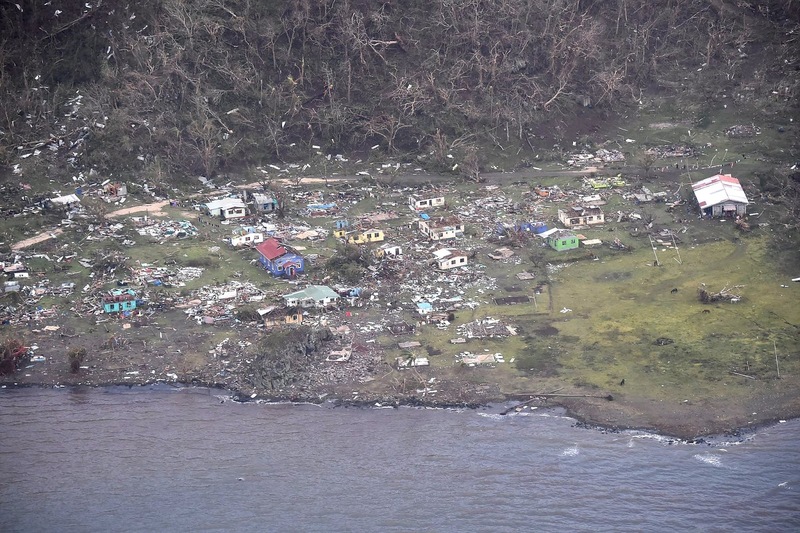 No we really don’t need anything – but should you want to make a valuable contribution, please make a donation to the Fiji Red Cross or to the Prime Minister’s Disaster Relief and Rehabilitation Fund as right now, those are by far the most effective venues for quickly getting the right help to the affected people. Anyway, we’re open for business. Can’t wait to have my first look at Shark Reef that has been battered by phenomenal seas. We’ve recently established a shallow nursery for different endangered Giant Clams, and I’m fearing the worst – but who knows, we here are resilient. 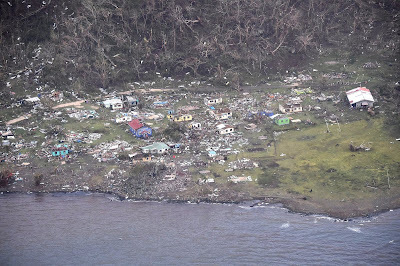 By Shark Divercyclone winston, Shark reef marine reserveComments Off on Our friends in Fiji made it through the cyclone! The shark dive at the Shark Reef Marine Reserve in Fiji has been dubbed “The best shark dive in the world” by none other than shark diving pioneers Ron and Valerie Taylor. Now Beqa Adventure Divers, the “Conservation project masquerading as a dive shop” that was instrumental in the creation of the reserve has received another great award. They were honored with the ANZ Excellence in Tourism award for Tourism Sustainability! This is a very prestigious award, being recognize as the best of the thousands of tourism businesses in Fiji! Congratulations to all the guys and gals at “BAD“ You are truly awesome! On a different note, I hope you guys are staying safe with Cyclone “Winston” heading your way. I’m looking forward to diving with you again in a couple of months. By Shark DiverANZ awards, Shark reef marine reserveComments Off on Is “BAD” really GOOD?